Jean Kazez: Wish Me Luck! 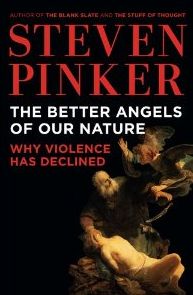 You have to like an author an awful lot to open an 832-page book, but I do like Steven Pinker a lot. The Language Instinct is a really great book. Now he's written a history of violence, and why it's declined. It seems like we've had the worst violence of all time in the last century, so how can that be? My curiosity about how he answers that question is part of the reason I ordered the book, so I sure hope he addresses it.